De-stem 8 handfuls of kale (curly, dino, purple, whichever variety you prefer) and break into small bite sized pieces. Add the kale pieces and the extra virgin olive oil to a large mixing bowl and toss until the olive oil is evenly distributed and all the kale pieces are covered. Set aside. Add all the ingredients for the seasoning to a food processor and process until it has a fine, crumbly texture. Sprinkle 1/4 of the seasoning onto the kale pieces and toss as you would a salad. Continue to sprinkle the seasoning, 1/4 at a time, tossing each time to make sure each piece of kale is covered. 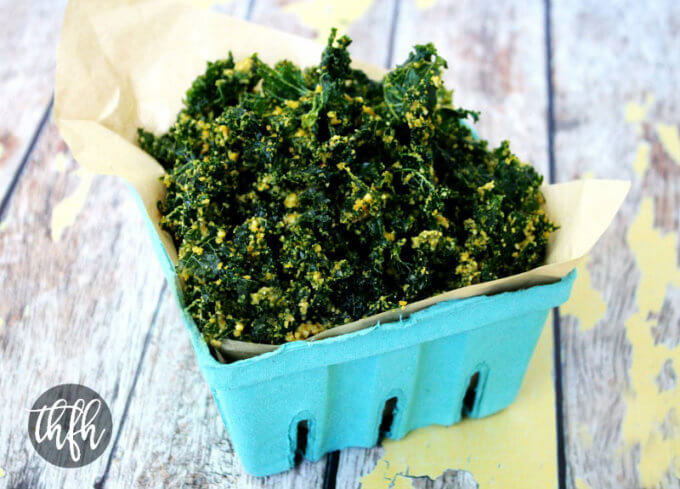 Transfer the seasoned kale pieces to a mesh dehydrator tray and dehydrate at 115 degrees for approximately 8-12 hours, or until they are dry and crispy. Store in an air-tight container because they will lose their crispiness if exposed to moisture in the air. The recipe and photographs for "Raw Vegan Cheesy Kale Chips" by Karielyn Tillman of The Healthy Family and Home website are licensed under a Creative Commons Attribution Non-Commercial No Derivatives 4.0 International License and cannot be used without my written permission.